Just noticed in the post that you linked to that your solution might not work if the USB is formatted in FAT32 (how ironic is that?). He suggested using "grub" instead, but I'm still stuck on where to start. Also, I don't have 8.10 actually installed on my PC (there's an issues getting it to auto partition and I'm not excited about setting the partitions manually, so I'm just using the DVD to run 8.10). Is there some type of terminal, like there is with a mac where I type all this in? Odd, this was my first comment, but for some reason it never posted. Luckily I had copied it to the clipboard prior to posting, so I was able to repaste it. Ok, so I'm a little stuck, like you. But unlike you, I'm totally new to Linux. I've installed 8.10 on a 2gig usb using the entire usb as the partition. I ended up getting an error message that said something about "could not find OS". Googled and discovered that one user fixed his issue by reformatting the stick to fat32 and then reinstalling 8.10. So I tried that and I got a different msg, "missing operating system". So I googled that and I got to your post. 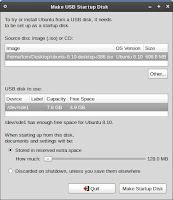 Unfortunately, I have no idea how to copy the files onto the usb drive using linux, since I'm a new user. On a pc I'd use a comand prompt, where is that on linux? I guess I'm hoping for more dumbed down step-by-step instructions for the total n00b. Can you help me out? The command prompt in gnome (Ubuntu) is in the main menu under accessories - terminal. In KDE is it called konsole, I am not sure where in the menu it would be located but you could hit alt-F2 and type konsole in to run it. To run the gnome terminal from the alt-F2 quick launcher you would type in gnome-terminal. Thanks for the comments. I wasn'r notified of any of these comment by blogger. Anyway...BoomBoomcars is absolutely correct with his comment about getting on to the terminal (command prompt in windows). So I hope this has fixed it for you. or something like that (i'm not sure about the number) and i have to restart. does anybody have any idea about this error?